Before I married, like many other young women, I had some remarkable notions about what I should do when I entered into the blissful state of matrimony. Long before I had the slightest chance of a husband, I had held down rules for the management of my domestic affairs: how I should have my house furnished; how I should dress, and how I should manage my children. To make sure that my plans were not based upon a sandy foundation, I made many indirect inquiries of some of my married friends, if such and such plans were not a good one, and on being answered in the affirmative, I concluded I must be a very clever young woman, and what a pity it was that I could not meet with a suitable partner to put such excellent plans into execution. Now it so happened that these views tallied exactly with some of mine, and consequently I considered the advice very wholesome and judicious. “Another thing, Sarah,” said the old lady, “I have not told you how you will be able to rule. It is very simple . . . .”. Just as the old lady was going to impart the grand secret, she was seized with a fit of coughing, and before it was over a neighbor came in, and I had heard enough to show me the value of my own plans, which I more than ever sighed to put into practice. About two years passed away, and I married. My husband was a journeyman printer, and, I must say it of him, was a very clever young man, and had contrived to save about forty pounds, which with what I had got, enabled us to take a nice house and furnish it well. No young people married more prudently than we did. In due time, we were settled down in our new home, and during my husband’s absence I could not help going from room to room, just to see how nice things looked; and then I looked forward to Saturday night – how I would lay out his wages, and with what pleasure I anticipated going out with him, and ordering things and paying for them, and being called Mrs. North by the tradesmen whom I intended to patronize. “I want this crown,” said he, “and now get your shawl, and we will go to market.” Now I had in my own mind laid out all his money, and thus to be stopped five shillings was not to be endured; and, besides, I thought I might just as well show Peter at once that I did not mean to be put off with part of his wages. “Begin as you mean to go on,” my ancient friend would have said if I had told her, and another thing I had heard her say scores of times – “What was it that made so many men drunkards? Why, because their wives let them have too much money of a Saturday night out of their wages. Talk about keeping a husband steady, why there is only one way to do it, and that is to keep him without money. Depend upon it, Sarah, nothing keeps a man so steady as being without money.” All these views I firmly believed in, and now was the time to prove the wisdom of them. “No, Peter,” said I, with all the dignity that I could assume, “I shall have all or none;” and, with a scornful look and toss of the head, I pushed the money back, and told him that as I was not fit to be trusted with it he might as well keep the whole. I had always found that a scornful look and a peculiar toss of the head, before I married, was enough to bring Peter to his senses, and of I expected it would this time; but I found I was mistaken, and that a husband was not so manageable as I had anticipated. “Now then,” said he, in a tone I had never heard him use before, “do you mean to take it or not?” Now is the time, Sarah; if you give way you will always have to do so, were the thoughts that ran through my mind, and so I replied I would never touch a penny of it if I had not the whole. He looked at me for a moment. “Ah,” thought I, “you are coming around, are you? Another scornful look will do it.” But instead of giving me the five shillings, he actually caught up the sovereign and said “Nor more ye shall!” He left the house, slamming the door after him. I did not feel much frightened. I thought he would come back in half an hour, so I got my bonnet out and laid his coat ready, and, in fact, prepared all things to go to market when he came in, which I felt certain he would do. Thus half an hour passed away, and I began to think him long. Two hours passed away and still he did not come. I began to think myself as a very ill-used woman, and to consider what was best to be done. To go and find him was out of the question, as I did not know where he was. Our beautiful new clock struck ten, and no Peter came. I then went – and, to say the truth, with an aching heart – to put my things away, as it was out of the question to think of going out then. I made up the fire, and sat down to wait for him, as I felt sure he would soon return. I fell asleep, and when I awoke the fire was nearly out, and the clock pointed to the hour of one. I now began to feel frightened, for what could have become of him? And surely he must have had an accident, or he would not have remained out so late. I did not go to bed that night. I knew I could not sleep, and I was afraid to leave my husband. About six o’clock he woke, shivering with cold. “Sarah,” said he, “Get me a cup of tea.” It is my turn now, thought I, and so I said, “Certainly, Peter; you must expect it. Don’t you think it would be better to go and ask them to make your tea where you got drunk?” “Then you won’t get it,” said he. I saw he was almost dying with thirst and I was determined that he should suffer, so I said, “Certainly not.” With that he jumped up, ran upstairs for his watch, and I saw no more of him till the following Wednesday. Wednesday came and at noon in came Peter, but as I had no money on Saturday, how could he expect to have anything to eat? And besides, how did I know he was coming home? So I told him that I considered he ought to be ashamed of himself, and further that where he had been for the last three days he had better go again. “Well, let bygones be forgotten,” said he. “No,” said I with a frown, which I knew he did not like; “I shall not let bygones be forgotten, but I shall tell you of it every time you come home for at least some time to come. I see you do not like it, but you should behave yourself in a proper manner, and not go swilling.” As I am a living woman, when I got thus far with my lecture, he jumped up and threw himself out of the house. “Very well, my lord,” said I, when he was gone, “I see I have caught a Tartar, but I will manage you yet, as sure as your name is Peter. I will make your life a burden to you if you do not fall into my plans. 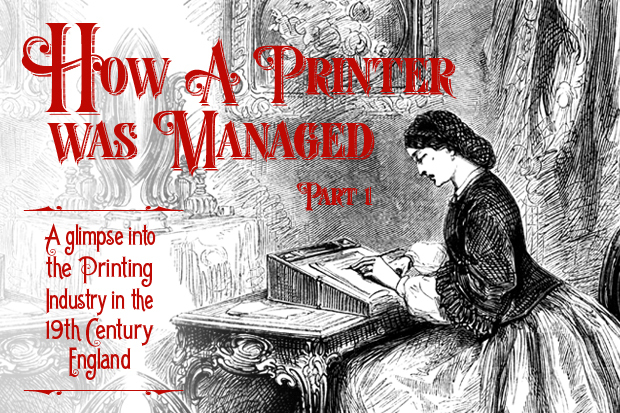 In the 19th century England, printers and binders belonged to the skilled lower working class, along with the cabinet makers, musical instrument makers, bakers and butchers. They would be making 28 to 35 shillings weekly, depending on where they lived. 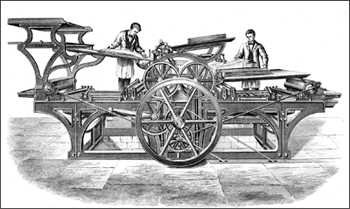 According to the 1867 census, there were 28,350 printers and binders employed in printshops thoughout England. To be a journeyman printer, Peter would have to first serve 7 years as an apprentice. Printing companies at the time employed both men and women - even young children.